The things we saw. The foods we tasted. The people we talked to. The facts we learned. Most of all... the FUN WE HAD!! Seattle's Vegfest is the largest vegetarian-food festival in the country, with 14,000 visitors last year. 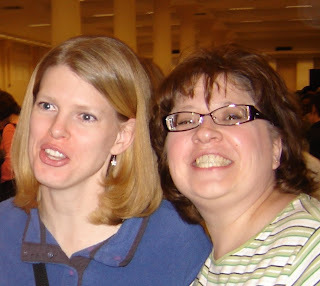 I realize my ramblings may seem a bit redundant, 'cause I've blogged about previous year's VegFests here and here and on and on... and I do tend to get carried away. See... instead of the usual group of fellow vegans/vegetarians, I branched out and brought several friends who are definitely not vegetarian, as well as a crew of teenagers, (including my daughter who actually IS vegetarian - I had to have SOME support after all!). One of my favorites first: (OK, everything was a favorite) Best vegan treats in Seattle - at least in my book. 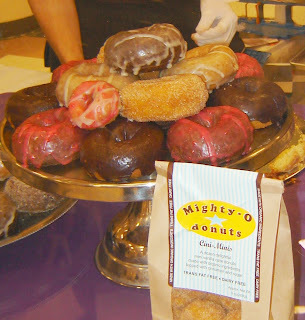 Mighty-O Doughnuts. Yes, you CAN be vegan and indulge in sugary, fried pastry goodness! The picture doesn't do them justice. Wish you could have been there. A Vegetarian Festival isn't complete without tofu of course, and this is hands down the Best Tofu in the World that I know of. I LOVE this tofu so much! I could be their spokesperson! 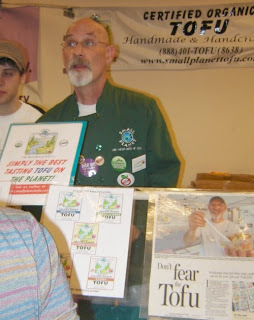 Moving on, another of our favorite vendors was Dave, of Dave's Killer Bread. We make sure to visit every year. Go to his website, read his story. Be amazed. Oh, and try some bread too, you'll never, ever want any other bread. It's been our family's favorite for over a year now. And sorry to tempt those of you who live far, far away... it's a local (Portland) thing. 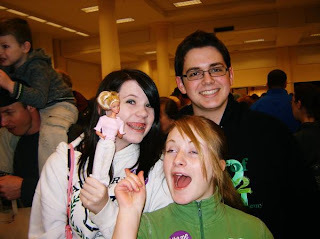 Dave totally charmed my daughter by posing with Barbie for her blog. You'll have to visit Barbie's Blog to see more. Weirdest and most "Un-Vegan-Like" item: "Cavi-Art vegetarian Caviar," made from seaweed. The kids were braver than I was, too fish-egg realistic for me, and I tried it last year, so I'm exempt, aren't I? While my daughter wasn't impressed, her friend Tanner almost liked it, I think. 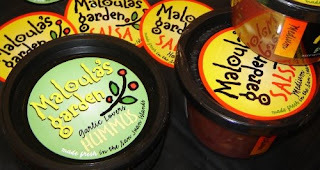 Well, Maloula's Garden Garlic Hummus was honestly really awesome stuff - definitely stood out from the crowd. That's high praise coming from a hummus-snob like myself who really never eats store-bought. Another local product too!! 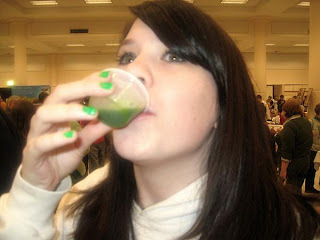 We don't remember what this green drink is. My daughter thinks it was a hemp-something-or-other, but I think it looks more like one of the many green drinks being sampled (way too many since I'm NOT a fan of green drinks!!). 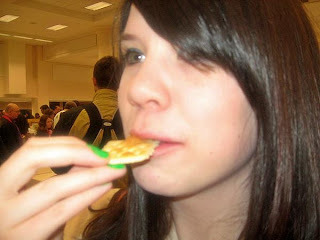 We all cheered her on for being brave enough to try it!! 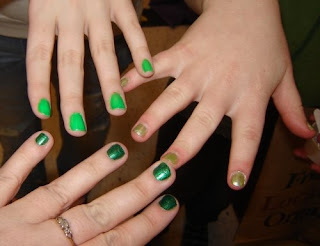 And speaking of green, I'd like to take a moment to point out our NAILS, which we'd thoughtfully painted a nice eco-friendly GREEN color in honor of today! 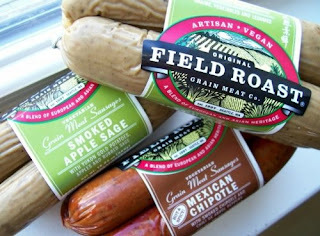 Last, but definitely NOT least, my wonderful friends over at Field Roast!! OK, not friends, like good-buddy-pals, but I consider them such, all the same. 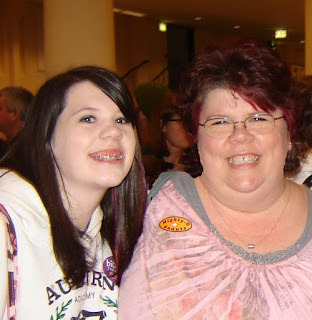 They always recognize me from my blog and are SO friendly. They're an amazing, tasty and again LOCAL company! Last year they even gave me a great Field Roast tee shirt - I should have worn it today!! 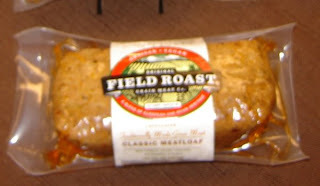 Field Roast was sampling their new MEATLOAF which will be available in stores in a month or so. EXCELLANT and as you'd expect - SO tasty!! Too bad I got a crap picture. 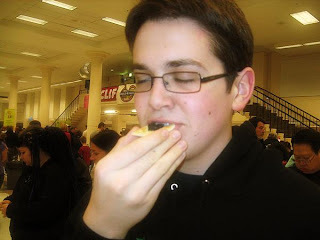 It didn't taste like crap, I swear!! We ended the day with full tummies, a little craziness and way too many new and tasty ideas. 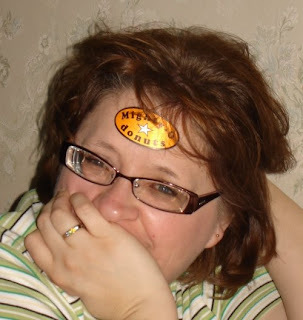 My friend Tanya became particularly attached to the Mighty-O donuts sticker. We just pretended she wasn't with our group. 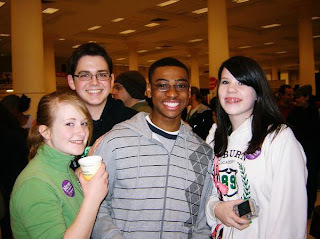 If you're ever in Seattle around the end of March, VegFest is an AWESOME destination. I'm as jealous as I am every year when I read your veg fest post!!! looks like you had a great time. I want a donut!! Hey! that's so awesome! I wish vegfest would come to Mexico, but oh well! hehe. I'm happy you had a great time. What a great time! I too am jealous every year. I'm jealous too!! The only thing we would have like that in the Detroit area would be FRIED-FEST and NOTHING would be vegan. Oh my gosh I never knew things like this existed!!!! What a blast!!! Sounds like y'all had a ball!